For me, going to Yankee Stadium was a dream realised. I can’t even claim to be a die-hard New York Baseball fan, but there is something iconic about Yankee Stadium that made it sit on top of my (ever-growing) ‘must-see’ list. One of the local New Yorkers we met on this trip put it into perspective when she said, ‘It’s the Mona Lisa for baseball fans’. I since realised that this was probably an adaptation to the famous George Steinbrenner quote: ’Owning the Yankees, is like owning the Mona Lisa’…but I will give her the benefit of the doubt! Seeing the gold ‘Yankee Stadium’ sign sitting above gate 6 had a certain aura to it. It felt like we were heading into a coliseum. Inside, the banners of the old Yankee greats lining the walls added to that feeling. The excitement among the Yankee fans was palpable. On this occasion, the Yankees were playing the Astro’s on a beautiful August night. It was Derek Jeter’s farewell season, so the atmosphere was crazy in there. Despite forgetting to consult the Yankee Stadium Seating Chart prior to booking, our seats in Section 410 were not bad at all! They cost us about $15 each for the ticket. It was pretty high up, but it gave you a really good appreciation for the size of the stadium. I got the obligatory jumbo dog, fat fries and large beer combo (in a Derek Jeter collectible cup) it’s fair to say I was in my element. In a weird way, I actually really enjoyed the Subway trip out there too. I eavesdropped on a lot of the conversations going on, and for me, hearing the debates and deep analysis from fans, who are decked out in their Yankee gear, going to the game, really helped get me extra hyped for it. Since re-telling my Yankee stadium experience to all that were prepared to listen, I realised that there were a few rookie errors that I made, which could have been easily avoided. To make sure that you don’t make the same errors, we have shared some tips that were provided by fans on Sports Where I Am. 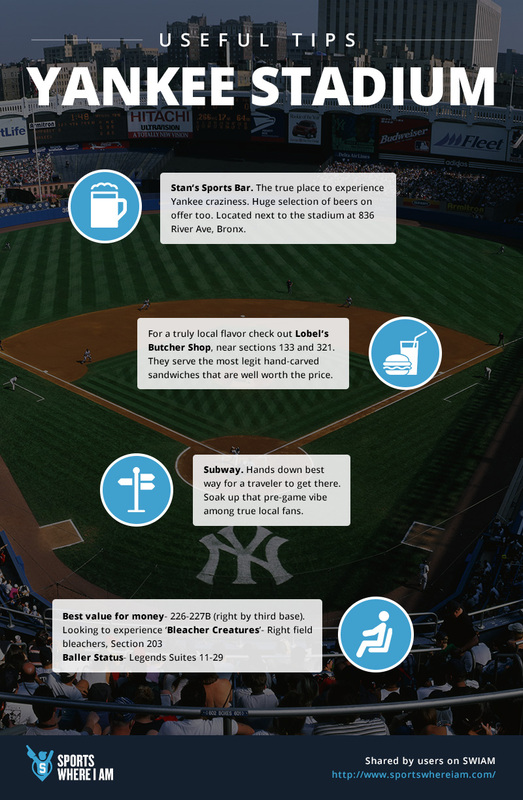 I hope this helps make your Yankee Stadium visit an event to remember! Download our app to add your own Yankee Stadium tips!